Greek geometrical planetary astronomy was taken over, preserved, and improved in the Islamic world, even though the preponderant preference among Muslim philosophers was for a realistic model of the physical world composed of spheres rather than circles. In the West, where Ptolemy's Almagest was long unknown, interest focused even more strongly on Aristotelian physical science than on the astronomy of epicycles, deferents, and equants. Physical and astronomical studies were customarily separate. Nonetheless, potential connections between geometrical planetary astronomy and Aristotle's physical cosmology warrant a brief survey of some particular developments in physics during the Middle Ages, that would be essential for the subsequent Copernican and Newtonian revolutions. In Aristotle's physical world, the place of the Earth in the middle of the heavens was deducible from physical principles, and rotation of the Earth would lead to ridiculous consequences. Were a heliocentric hypothesis ever to receive serious attention, it would not only have to save the phenomena using uniform circular motions, but it would also have to be physically plausible. That could not occur absent modifications to Aristotle's physics. 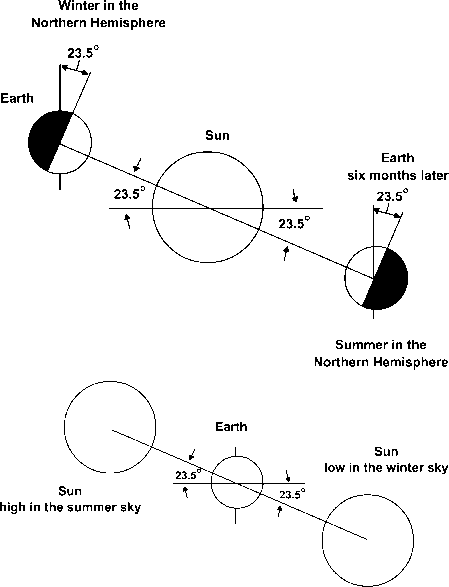 Ancient postulations of heliocentric hypotheses by both Hericlides and Aristarchus had been premature and easily ignored. Because a Sun-centered system was eventually accepted, it is tempting to search for related changes in Aristotelian physics and then celebrate them as inevitable steps along the road to modern science. We might select evidence that supports a straightforward and logical development from impressed force to momentum to inertia and ignore all else. Retrospectively singling out part of an ancient scientist's work solely on the basis of its resemblance to current ideas is not a good way to practice history. But with limited space available and a definite issue at hand—the impossibility of a heliocentric system under Aristotelian physics, and yet its eventual acceptance—practical considerations suggest a focus on particular intellectual developments. This we do here, but not without first giving fair warning to readers. Unlike Ptolemy's Almagest, produced after the handbook transmission period and consequently unavailable in the Roman world, Aristotle's writings were well known and the subject of extensive commentaries and criticisms. At least in that part of the Roman Empire in which learning and scholarship flourished, for as long as they did. The Roman Empire split into eastern and western halves in a.d. 284, and briefly reunited under the emperor Constantine. He transferred his capital in a.d. 330 to Byzantium, which was renamed Constantinople (now Istanbul). By a.d. 476 the Western Empire had fallen to a series of invading barbarians. The Eastern Empire survived until a.d. 1453, when Constantinople fell to the Turks. The Eastern Empire enjoyed, during an otherwise slow decline, a brief renaissance in the sixth century a.d. Among the important scholarly works produced was a commentary on Aristotle by John Philoponus in a.d. 517. He is thought to have worked in Alexandria. Aristotle had insisted on continuous contact between the mover and the body forced to move in a direction other than that of its natural motion. The need for continuous contact made movement in a vacuum supposedly impossible. It also made it difficult to explain how an arrow shot from a bow continued in motion with continuing contact between the mover and the moved. Somehow, air pushed forward by the arrow had to get around to the rear of the arrow and then push the arrow from behind. (Antiperistasis was Aristotle's term for this phenomenon.) Philoponus found this convoluted explanation bordering on the fantastic. An alternative Aristotelian explanation also maintaining contact between the mover and the moved was that the air on being pushed received an impetus to motion and kept moving along with the arrow, remaining in contact with the arrow and pushing it, until the impetus impressed on the air dissipated. But this explanation was easily refuted. If the air were moving the arrow, then there would be no need for any contact between the arrow and the bow string, or between a hand and a thrown stone. In place of the obviously inadequate Aristotelian explanations, Philoponus proposed instead a hypothesis of impressed force. He found it necessary to assume that some incorporeal motive force was imparted by the projector to the projectile. Furthermore, Philoponus's thoughts ranged upward from arrows and stones to stellar movements, which he also attributed to an impressed impetus. God who had created the Moon, the Sun, and the other heavenly bodies could also have implanted a motive power into them. In a.d. 529 the emperor Justinian closed Plato's Academy in Athens, citing it as a center of paganism. Some of the persecuted scholars fled eastward, to Persia, taking with them the writings of Philoponus and others. There Aristotelian studies would flourish, especially under Islamic civilization beginning a century later. By the tenth century a.d., there was some Western contact with Muslim learning, and the eleventh and twelfth centuries saw an increase in translations of Arab and Greek works, mainly in Spain and in Sicily, on the borders between Islamic and Christian lands. Almost all of Aristotle's work, along with commentaries and criticisms, was available in Latin early in the thirteenth century. Jean Buridan (ca. 1295-1358), who taught natural philosophy at the University of Paris, wrote several commentaries on books by Aristotle. The university curriculum was then based largely on the study of Aristotle's works on logic and natural philosophy, and a tightly integrated Aristotelian vision of the world dominated thinking. When Buridan raised questions about particular aspects of Aristotle's physics of motion, he undermined the entire foundation of Aristotelian cosmology. Presentations were neither modern nor scientific in spirit. There was no genuine inquiry aimed at developing a new understanding of nature. Everyone knew what the questions were and what the answers would be. The aim of an exercise was skillful presentation of known information, not discovery of new information. In this, Buridan was a noteworthy exception. He sought to answer whether a projectile after leaving the hand of the projector is moved by the air, or by what. This question he judged to be very difficult because Aristotle had not solved it well. Buridan, as Philopanus had earlier, rejected both Aristotelian explanations. Buridan argued that in the case of a toy top or a blacksmith's grinding wheel, which move for long times yet do not leave their places, air did not follow along and fill up the place of departure. Nor could air moving swiftly alongside the smith's wheel be the force moving it, because, if air on all sides near the wheel was cut off by a cloth, the wheel continued to move. Therefore it is not moved by the air. Although Buridan was passionate in his reasoning, he nonetheless rejected the Aristotelian position that there can be established necessary principles of physics. The problem was that truths necessary to philosophy could be contradictory to dogmas of the Christian faith. In a.d. 1270 the bishop of Paris condemned several propositions derived from the teachings of Aristotle, including the eternity of the world and the necessary control of terrestrial events by celestial bodies. In a.d. 1277 the Pope directed the bishop to investigate intellectual controversies at the university, and within three weeks the bishop condemned over two hundred more propositions. Excommunication was the penalty for holding even one of the damned errors. Buridan helped develop a nominalist thesis. It conceded the divine omnipotence of Christian doctrine but at the same time established natural philosophy as a respected subject and defined it in a way that, while acceding to religious authority, also removed natural philosophy from under religious authority. Science was understood as a working hypothesis in agreement with observed phenomena. But we cannot, Buridan argued, insist on the truth of any particular working hypothesis. God could have made the world in some different manner but with the same set of observational consequences. Therefore, scientific theories are tentative, not necessary, and can pose no challenge to religious authority. The nominalist thesis was a convenient stance to take in a time when religious matters were taken seriously and heretical opinions could place their adherents in serious trouble with powerful ecclesiastical authorities. But we should not jump to the conclusion that Buridan was playing a cynical game when he ended his presentation of impetus theory by deferring to religious authority. He wrote: "But this I do not say assertively, but so that I might seek from the theological masters what they might teach me in these matters as to how these things take place" (Hetherington, Encyclopedia of Cosmology, 50). Buridan almost certainly was sincere in this statement. In the new intellectual climate of nominalism, imaginative and ingenious discussions, even concerning the possible rotation of the Earth, flourished. Some historians assert that the scientific revolution of the sixteenth and seventeenth centuries owes much to the condemnation of 1277. Though intended to contain and control scientific inquiry, the condemnation may have helped free cosmology from Aristotelian prejudices and modes of argument. Nominalism has much in common with instrumentalism. Both philosophical concepts posit scientific theories as working hypotheses with no necessary links to reality. One might speculate that Catholic historians and philosophers of science in the twentieth century, justifiably impressed with fourteenth-century nominalism and also eager to praise the admirable achievements of that era by scholars working within and supported by the Catholic church, consequently were predisposed to formulate the concept of instrumentalism. Nominalism stripped of its religious context became instrumentalism, and nominalists were favorably pictured as forerunners of modern, philosophically sophisticated instrumentalists. Newton. Inevitably, some of their necessary cosmological principles would conflict with dogmas of the Christian faith. Buridan's thoughts were further advanced by his student Nicole Oresme. Regarding the possible rotation of the Earth, Oresme wrote: "But it seems to me, subject to correction, that one could support well and give luster to the opinion that the Earth, and not the Heavens, is moved with a daily movement" (Hetherington, Encyclopedia of Cosmology, 451). Oresme proceeded to demolish the arguments against the possible rotation of the Earth. Yes, the Sun, the Moon, and the stars are perceived to move with respect to the Earth, but a person on a moving ship would similarly perceive a ship at rest as moving. There was no strong wind from the east because the lower air and the water are moved with the Earth, as is the air enclosed in the cabin of a moving ship. And the arrow or stone projected upward was also moved eastward with the diurnal movement and thus returned to the same place on the Earth from which it left. Oresme summed up his arguments, emphasizing the concept of relative motion: "It is apparent then how one cannot demonstrate by any experience whatever that the Heavens are moved with daily movement, because . . . if an observer is in the Heavens and he sees the Earth clearly, the Earth would seem to be moved; and if the observer were on the Earth, the Heavens would seem to be moved" (Hetherington, Encyclopedia of Cosmology, 452). Oresme acknowledged that the rotation of the Earth seemed to be against holy scripture, which said that the Sun riseth, and goeth down, and returneth to his place; and God created the orb of the Earth, which will not be moved; and the Sun was halted in the time of Joshua and turned back in the time of King Ezechias. To these objections Oresme answered that holy scripture was not to be read literally but was to be understood, rather, as conforming to the manner of common human speech. Furthermore, there was an aesthetic reason to place the observed rotation in the Earth rather than in the heavens. Oresme noted that: "Since all the effects which we see can be accomplished and all the appearances saved by substituting for this [the rotation of the heavens] a small operation, the diur nal movement of the Earth, which is very small in comparison with the Heavens, and without making the operations so diverse and outrageously great, it follows that if the Heaven rather than the Earth is moved, God and Nature would have made and ordained things for nought, but this is not fitting" (Hetherington, Encyclopedia of Cosmology, 452). Oresme, however, could not leave things here. He was too close to asserting truths necessary to philosophy that could be contradictory to dogmas of the Christian faith. He concluded: "Yet nevertheless everyone holds and I believe that the Heavens and not the Earth are so moved . . . not withstanding the arguments to the contrary . . . because they are 'persuasions' which do not make the conclusions evident. This, that which I have said by way of diversion in this manner can be valuable to refute and check those who would impugn our faith by argument" (Hetherington, Encyclopedia of Cosmology, 453). If Oresme the nominalist was not ready to insist on the truth of the heliocentric hypothesis, he nonetheless had worked out much of the reasoning that more intrepid philosophers would employ centuries later. Aristotelianism and Christian theology fused into Scholasticism, a way of thought which permeated Western Europe between roughly a.d. 1200 and 1500, especially in universities. Unsympathetic critics might consider much of Scholastic philosophy merely semantic squabbling. Indeed, the adjective scholastic has become pejorative, defining obscure and irrelevant discussion of no practical value. Figure 13.1: Ptolemy and Regiomontanus are seated beneath an armillary sphere. 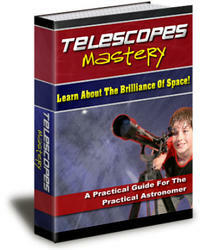 It was used to measure coordinates (longitude and latitude) of celestial bodies. 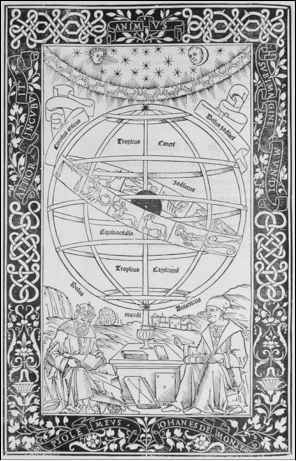 Frontispiece, Regiomontanus, Epitome of the Almagest, 1496. Image copyright History of Science Collections, University of Oklahoma Libraries.